Who Slept on Dr. Warren’s Mattresses? Maj. Scarborough Gridley never even went onto the Charlestown peninsula. His cousin Capt. Samuel Gridley and Capt. John Callender did get to the redoubt on Breed’s Hill, but then discovered their guns were too small and their gunpowder cartridges too large. The latter two pulled back, one even after Gen. Israel Putnam had met him and ordered him forward again at gunpoint. The exception to that pattern was Capt. Samuel Russell Trevett of Marblehead. He was assigned to follow Maj. Gridley, but when he realized his superior wasn’t budging he defied orders and advanced to Charlestown on his own. Trevett and his company were the only American artillerists active in the thick of the battle. I commanded a company of artillery from the town of Marblehead, attached to Col. Richard Gridley’s regiment, stationed at Cambridge. 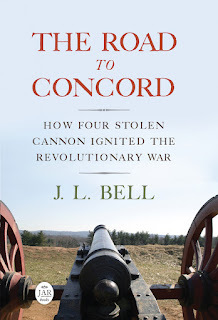 About one o’clock in the afternoon of the 17th of June, 1775, I left Cambridge with my company, for Bunker’s Hill. When about a quarter of a mile from the Colleges, I saw Gen. Putnam pass upon a horse towards the town of Cambridge, and in 15 or 20 minutes I saw him pass in like manner towards Charlestown. I proceeded on with my company, and soon after joined that part of the American force at the rail fence, towards Mystic river, the Americans commenced a general retreat. As I was descending the north west side of Bunker’s Hill, I again saw Gen. Putnam in the same place, putting his tent upon his horse. I asked him where I should retreat with the field piece I had brought off, he replied to Cambridge, and I accordingly marched my company to Cambridge. Unfortunately, Trevett wrote that letter to answer questions about whether Putnam was in command during the battle—a consuming issue for authors in the early 1800s. Trevett didn’t leave a full account of the battle, which means we’re missing his memory of the most interesting parts. Worst of all, we don’t have Trevett’s memory of how he felt when Putnam reported that the artillery officer who had refused orders to go back into the fight was named Trevett. TOMORROW: The Massachusetts government tries to clean up this mess. And have I mentioned that I’ll be speaking about the new commander-in-chief’s response to the whole situation on Tuesday at 7:00 P.M. at Anderson House? So how come historically the Gridleys come off smelling like a rose? There are memorials to them in their hometown, for example. Perhaps I missed something? There's a big memorial to Col. Richard Gridley in the Canton cemetery, erected in the late 1800s. The major proponent of that memorial was Daniel Huntoon, who wrote a lot of articles about Gridley in historical and Masonic magazines and in a local history. Hunton also overstated Gridley's rank (major general instead of colonel) and downplayed the evidence that Washington had lost confidence in him by the fall of 1775. So one reason the Gridley name retains a good reputation is literally selective memory. Col. Gridley did serve in three wars over thirty years. Unlike his son, he did go onto the Charlestown peninsula during the Battle of Bunker Hill, suffering a wound from the shelling. So those qualities allow people to admire Gridley for personal bravery even if his administration had a lot of flaws. I've not seen any reference of Trevett firing Grape, or I missed it. Do you have a source perchance? Always trying to perfect "1775" until I get a publisher. Thanks for the posts on the artillery. They are ignored too much in modern books, but clearly, it was a big deal, as they were are quickly court-martialed afterwards. As this posting discusses, we don’t have a lot of first-hand sources about what Trevett and his company did. I wrote “apparently” to indicate that doubt, but basically believe that the conditions of the battle dictated that grape or canister shot would have been most effective against the advancing British lines. The accounts of Putnam firing cannon mention those types of shot.